Decentralized management, purchasing and payment generated an environment of significant waste and overspending across all network elements. Web based internal functions and need for access to the Internet for publishing and internal private cloud was imperative but at what cost. The Client presented NSA with the opportunity to review the challenge at hand. We started by completing an Audit of the current spend across divisions and cost centers. Analyzing the results of the initial review, major areas of concern involving spend, usage and management were presented to the executive management team. Due to our upfront complimentary investment, the size of the initial recovery, projected savings to market rates, and recommendations to cure procedural hurdles; the executive team immediately engaged NSA to work with all divisions of the and provided complete support to eliminate any obstacles. This was a multi-year engagement, first isolating the inventory across the organization, elimination of waste, pursuit of credits for missed disconnects and contractual conflicts, culminating in a global RFP for all services wired and wireless. The executive management was so driven by the excessive spend invoiced by the incumbent vendors, they called for a full and complete RFP process to include technology change and co-terminus agreements across multiple providers. Streamlined agreements eliminating a multi-decade history including over 50 amendments were implemented to generate reduced network costs. Accurate inventory, cost center assignment and lower rates for current and anticipated network changes met or beat market for essential services. A market-based negotiation resulted in savings across all categories some as great as 29% representing over $6.3M in annual savings and an overall reduction of 35% in total annual network spend. Based on the client’s net profit margin, the engagement results would require over $79M in new annual sales and more than $239M of new sales revenue over the term of the negotiated agreement to produce $6.3M in net profits for the firm. A Multi-National Media firm with over $18M annual spend across seven critical categories and an emerging new technology. 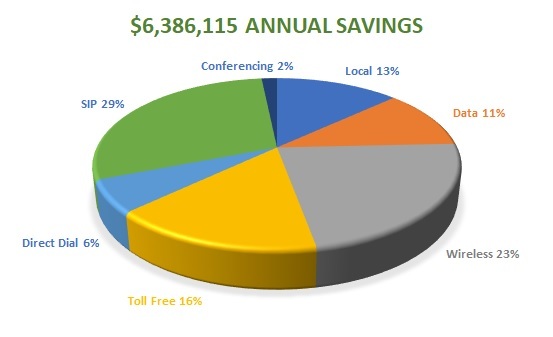 A market based negotiation resulted in savings across all categories some as great as 29% representing over $6.3M in annual savings and an overall reduction of 35% in total annual network spend.